George Eliot was always careful to point out that while there were no direct portrayals of actual people in her fiction, her characters ~ drawn from acute observation of human behaviour in all its variety. 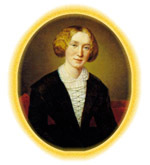 Thus, we can surmise from the nature and sequence of the events in Middlemarch (whose sub-title is "A Study in Provincial Life") that the fictional life might well be a reflection of the actual history of Coventry, which Mary Ann Evans had ample opportunity to study during her young life in the Midlands. Indeed, it is possible to get a little closer than surmise, when we find for example, the author calling a Middlemarch inn 'The Green Dragon', for there ~ an inn of that name in central Coventry, across the road from the ribbon warehouse owned by Charles Bray! There are good grounds, therefore, for the belief that there were actual people in the mind' s-eye of George Eliot when she was working -and the above brief reference to a music teacher is a case in point. We know from her journals that Mary Ann was given piano lessons at Griff by Edward Simms who came over from Coventry where he was organist in St. Michael's Church (later to become Coventry Cathedral). Simms was a remarkable man, a pillar of the musical scene in Coventry for over half the nineteenth century. He was born in Bromsgrove, Worcestershire, in 1800, and died in Coventry ninety-two years later. He had musical ability from an early age, and at thirteen was playing the church organ at Womborne in Staffordshire. He was sixteen when he went to London to study the organ under Thomas Adams at S t. Dunstan' s in the East in the City. Adams had a reputation as having noteworthy gifts of improvisation, and was known as 'The Thalberg of the organ' - a significant title, as will be seen. Simms's other teacher in London, for the piano, was the eminent German pianist, composer and teacher Friedrich Kalkbrenner (1785- 1849) who was in London for nine years up to 1823. Whilst studying with this famous man, who had once taught Chopin, Simms moved in the highest musical circles. He met Thomas Attwood, who had been Mozart's pupil; Attwood took him to a private recital and introduced him to Mendelssohn.